When we were pregnant, one of the questions we were frequently posed with was – will you be co-sleeping or keeping baby in the nursery? We were skeptical about having baby sleep with us in the same bed for the fear of hurting the baby or accidentally rolling over ( Amit turns a lot in his sleep and we have a queen bed … so it could get crowded ). With that fear in mind, it can only mean … cautious sleep, aka- disturbed sleep. And we all know, how much the quality of sleep matters especially if you are a new parent and trying to squeeze in byte-sized naps. But I really wanted to have the baby in our room. So we had decided pretty early on, that we were going with a bassinet for our room. 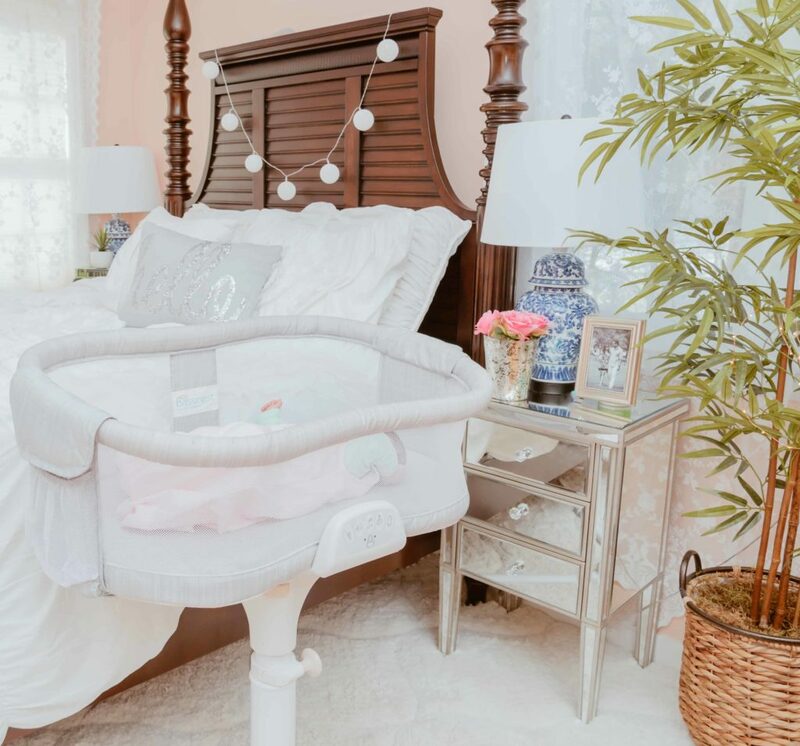 During our search for a bassinet, I really liked what the Halo Bassinest Swivel Sleeper, Luxe Plus had to offer. It is like an extension of your bed. The fact that you can rotate the Bassinest 360 degrees and bring the baby closer to you is just amazing. And whoever thought of the feature that the side wall that can be lowered to lift the baby … Thank You! Pure Genius! It made night-time feedings so convenient in the early weeks when you have to wake up every two hours to feed the baby. It might seem like a trivial feature but trust me being able to feed/calm the baby without having to get up from the bed is such a huge deal, when you are already tired and recovering from the delivery. And you can get out of bed by swiveling the Bassinest outward – sounds convenient? It really is! The Bassinest also has a jukebox as Amit and I like to call it – there are two levels of vibration options that Zoe loves and soothing white noises, one of which mimics the womb sound! 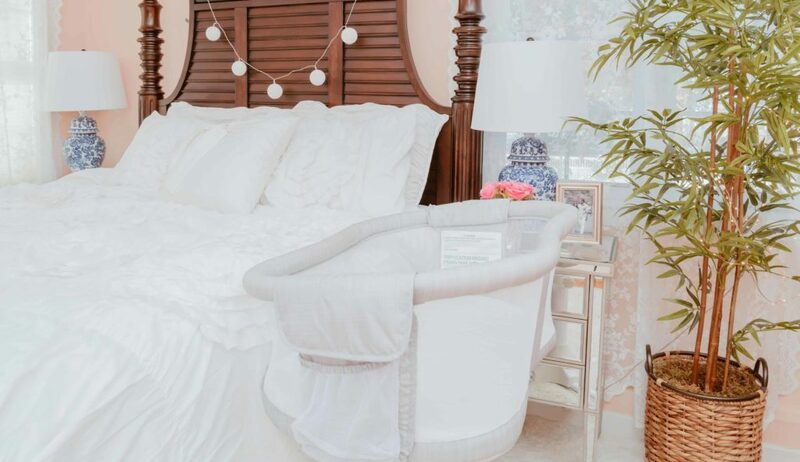 And not to mention – the Bassinest looks so stylish – I really love the minimalist white-gray look. 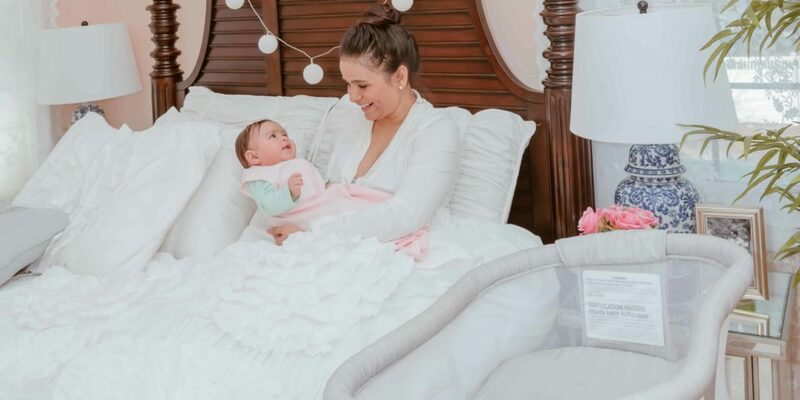 While I am not yet ready to put Zoe in her nursery yet ( cue in sobs when we do the actual transition ) , but we have been putting her in her crib every now and then for her afternoon naps, so she can get used to sleeping in her crib. 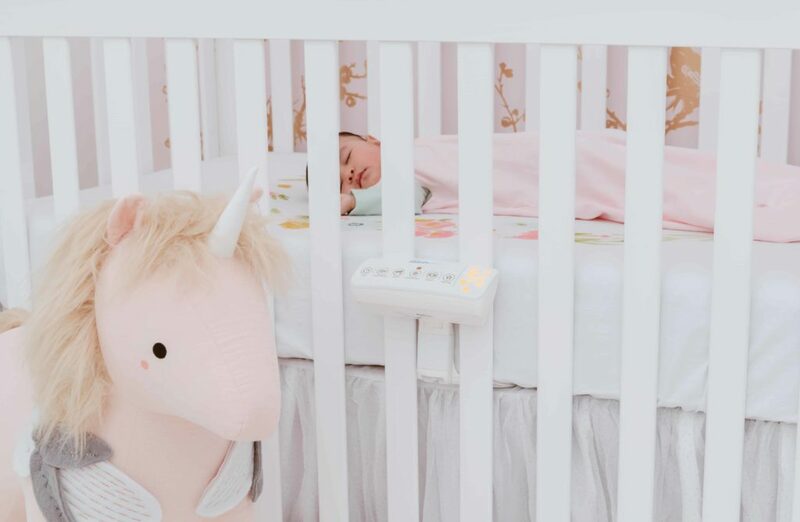 The HALO SnoozyPod is another genius product – it fits under the crib mattress without compromising safety or flatness of surface and offers the same vibrating motion as the Bassinest. It is meant for helping with transition from bassinet to the crib and from the few times we’ve used it so far, I can totally see why. 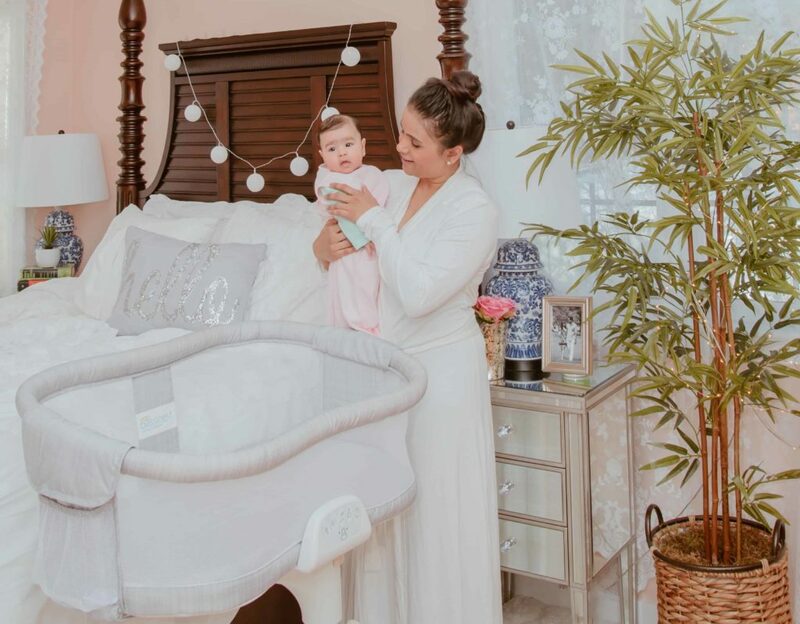 If you are an expecting parent looking for an alternative to co-sleeping or a bassinet in general, I definitely recommend the HALO Bassinest. 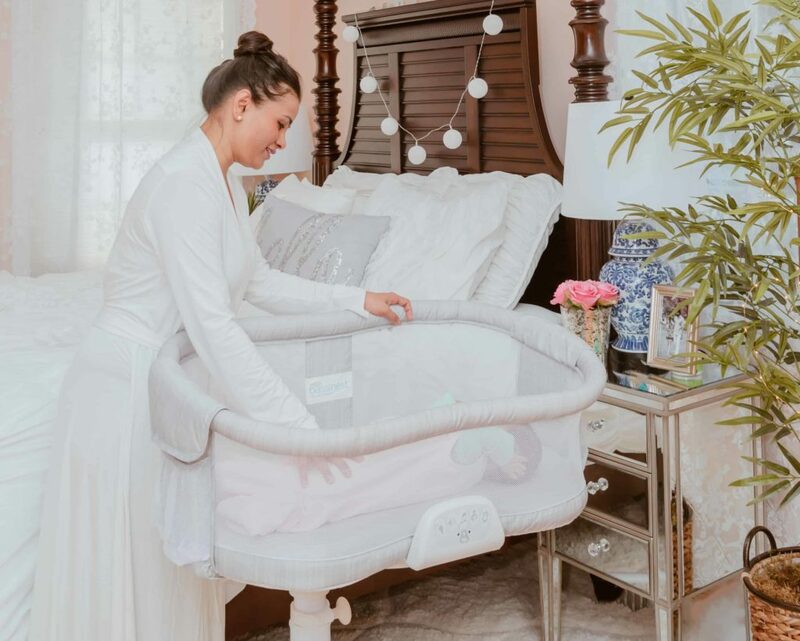 Aside from offering some really awesome features that I mentioned above, the fact that HALO products are created primarily keeping baby’s safety in mind, I think that speaks greatly about the mission of a brand. can you tell me how the installation of this bassinet was? Your room is so beautiful and congrats on your baby. OMg, this is too cute! Love these pictures. That looks like such a cool bassinet! What a gorgeous room! That bassinet is a practical idea too. The Swivel Sleeper is very cute,.. Nice pictures,..
You are right, having the baby beside you is something you might think about. Depends on the parents I guess.